Several of my acquaintances have had babies in the last month. There are so many cute handmade baby cards out there but I don't have hardly any baby themed stamp sets. I made these card with stamps from "all occasion" stamp set. The die cuts are what makes these cards extra special and precious. I'm only showing the pink version but the boy versions are just as beautiful. It's amazing what a little pink or blue cardstock die cut with a sweet sentiment will make. On the first card, the foot print is embossed using light pink embossing powder and Versamark ink. Both cards are available on my Etsy Shop, Handmade by Kathie K.
This next project, I have to admit, took a lot longer than I expected. However, once I figured out the design, the card came together very quickly and the time it took to plan was well worth it. I love how this wedding card turned out! It's actually more than a card but a keepsake that could adorn the new couples home as a sweet memory of their very special day. Even though this card was completed as a wedding card, the same card could be used as an anniversary card, birthday card, or welcoming the new addition to the family. Hopefully these step-by-step instructions will help you make this card very quickly. All of the supplies are listed below. Starting from the base and working up. Cut a piece of white shimmer paper 8 x 6; using a score board make two score lines on each side to make a score line frame. Score at 1/8" and 2/8". Adhere to the white card base. Cut a piece of designer paper 5 1/4 x 7 1/4- in this card I used a piece from my stash just to add a soft touch of color but anything would work. Cut a piece of white shimmer paper 5 x 7 - this is the piece to die cut to make the lacy background. I used two separate dies to achieve this look - I die cut one half of the paper and then the other. Tip: mix and match your dies - I experimented a lot which was super fun and discovered a couple of lacy backgrounds that I really like. Using foam strips or other dimensional adhesive, attached the lacy background to the designer paper. For me doing all of the die cutting at once worked best. You will need an ornate frame die, ovals, and an embellishment piece. Again, any die will work - you are building a focal point. I added just a hint of silver using a scalloped oval cut in silver shimmer paper, standard oval die one size smaller cut in designer paper, scalloped oval die two sizes smaller in shimmer paper. I also cut a scalloped oval piece for the message inside the card. I prefer to stamp and emboss the sentiment or message first then line up the oval die. This worked best for me. Die cut the embellishment out of white shimmer paper. Now you can assemble. Using adhesive, attach the sentiment oval to the designer paper oval. Using dimensionals or foam tape, adhere those ovals to the larger silver scalloped oval piece. Then using dimensionals again, adhere the oval stack to the ornate frame. This is the focal point for the card. Using foam tape, adhere the focal point to the center of the lace piece. Now you can embellish. I attached the embellishment piece that I die cut to the top of the ovals, added sheer ribbon tied in a double bow, paper flowers with leaves, and rhinestone flat-back jewels. I added some white Wink of Stella to the petal edges to give the card some subtle sparkle. Using foam tape on the back of the designer paper, center on top of the card base. Attach the die cut message to the inside of your card. Your card is done. Isn't it stunning! Because the card is has a lot of depth, an envelope would not be recommended and should be delivered in an envelope box pictured. Dies used in my card: Spellbinder's Cascading Grace Pocket, Spellbinder's Oval Ironwork, Spellbinder's Isadora Trinkets, Stampin' Up Oval set. Spellbinder's Venise Lace Cinch and Go Flowers Two was used to make the flowers. I hope you enjoy making this card as much as I did. If you would like to purchase this card, please visit my Etsy shop here. I really like making oriental themed noted cards. They can be used for almost any sentiment - thank you, sympathy, thinking of you, or just a note card. Below is a set of 5 note cards that I made for a gift. All the cards are 5 1/2 x 4 1/4 and each one has a matching envelope. Three of these card use polished stone paper that I made - I have an earlier post that gives you the instructions. I think the oriental stamped images look great with the paper colors. 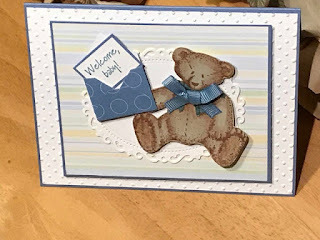 The embellishments are little different on each card - each one has a ribbon or cording in different colors and textures. I really had a lot fun making these cards. I hope you give this a try. You can see this set and many more on my Etsy shop. Thanks for stopping by. Happy stamping.